Traditional clipboard with quality new style, small wire flat clip to hold papers and pen secure. Includes a retractable hanging hook. Old style traditional clipboard with large, lever style spring loaded bulldog clip. 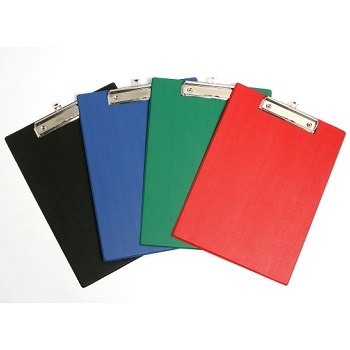 Quality PVC clipboards with metal clip and retractable hanging hook. PVC is durable and wipes clean. Available in a choice of colours. 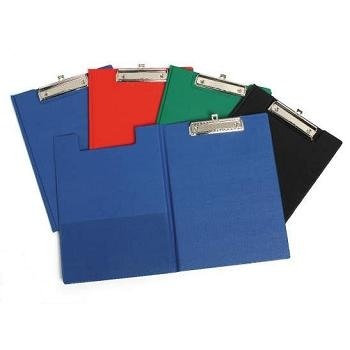 Strong, rigid PVC Clipfolders for easy writing anywhere. Clipfolders are ideal for the home, school or office. Bright fruit coloured clipfolders - use a different colour to identify subject, department, urgency etc. Spring clip mechanism with retractable hanging hook. Complete with clear inside pocket for additional storage. Durable and strong - manufactured from quality PVC. These clipfolders feature stitched reinforced edges and metal corners that even the roughest handling won't damage. Each clipfolder has 2 inside pockets and spring loaded metal clip. Covered in PVC they are ideal for use by warehouse staff and delivery drivers. Tough, thick compressed aluminium clipboard. Virtually indestructible - will not bend or warp. Chrome-plated lever clip to hold your papers secure. Includes a retractable hanging clip. A clipboard and display board in one. Displays and protects reference sheets in the insert cover whilst allowing you to use a clipboard. Pull out hanging hook for easy storage. Includes a large capacity internal storage section ideal for notepads and pens. Ideal for home, office and school use.